Region: This borer can be found throughout most of North America, except in the far west areas. Life cycle: This insect produces one generation each year and overwinters as an adult weevil in garden rubbish. Physical description: The grub is a yellowish white with a brown head and is about 1/3 inch long. The adult is a 1/10 to 1/5 inch long blue/black weevil with fine gray hairs and three black spots at the base of its wing covers. The single eggs are laid in holes within stems and petioles. 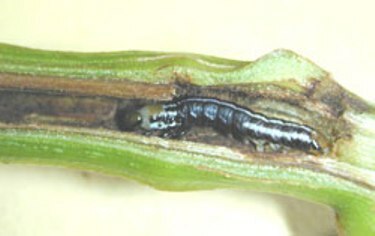 Feeding characteristics: This borer attacks eggplant, ground- cherry, potato and tomato plants by hollowing out the stems causing them to wilt and die. In the spring, the adults chew holes in the stems. Controls: Remove the Borers by making a slit in the infested area and pick the insect out. Cover the injured stem with soil to encourage rooting.